Zakir Naik is a public figure who has changed the lives of millions (including me). There are many youths who has chosen a religious life because of his efforts. The struggle Zakir naik has done in changing the lives of the people is unthinkable. 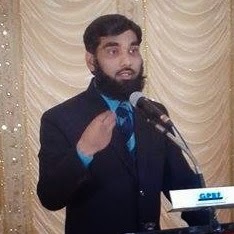 He was a medical student and was aspiring to become a cardiologist like Chris Barnard – who performed the world's first human heart transplant operation on 3 December 1967 - but he got inspired by Ahmed Deedat – a famous speaker known as Muslim scholar of the Christian Bible – and passionately followed his footstep and sacrificed his profession from a doctor of body to doctor of soul. He fervently worked to spread the message of Islam in the most appropriate manner. Quoting the various verses from the scriptures, Dr Zakir Naik tries to bring the various communities close to each other. He takes open questions from the audience – which spiritual gurus rarely take – and gives them convincing answers in the light of various scriptures, science, history, with reasoning and logic. His unique style of presentation and convincing answers led millions to get inspired from him. If you see his videos – which are available on his YouTube channel or on Peace TV – you will find many people getting influenced by him and appreciating his work. From the millions who got inspired from him, how many are terrorists? How many have walked on the path of violence? The handful who chose the wrong path cannot get influenced by him as he regularly condemns all kinds of terrorist attacks. They haven’t followed the wrong path due to his lectures but they read junk articles and watch junk videos which are supported by the Anti-Islamic forces to malign Islam and instigate the youth to walk on the path of violence. How can Zakir Naik be responsible for what they read and watch? How can Zakir Naik be responsible for their acts which are not even supported by him? He never supported terrorism in any way. His speeches are based on Islam and contemporary issues in the light of comparative religions, science, history and logic. He never promoted terrorism. There are various centres operating in India for peace and harmony are influenced by him and his preaching. People are questioning their illogical beliefs to their gurus – whether it is Muslims or Non-Muslims – seeking answers for what they practice. 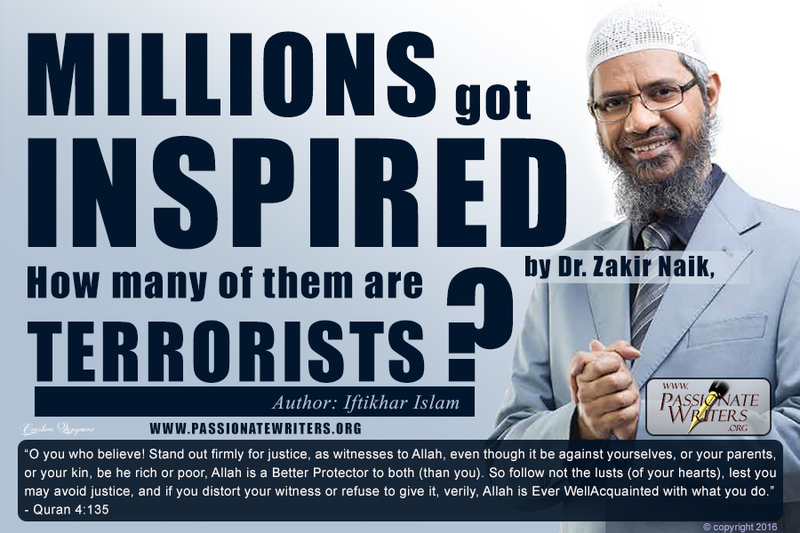 A vast majority of those who are influenced by Zakir Naik are on the path of righteousness. Those who are on the path of violence can never get influenced by him. Even those who ‘like’ or ‘follow’ him on social networking sites and walked on the path of violence can never get influenced by him (for sure). It is the conspiracy of Anti-Islamic forces to malign Zakir Naik and stop his work. They know once they succeed in stopping Zakir Naik, they can stop any Muslim who is trying to spread the message of Islam. Destruction on the eve of New Year - a moment to think.. I Love her, Do you? Nip the Evil in the Bud - opt for Early Marriage. Read our Copyright Policy before 'posting' our articles on your blogs etc.